That some concepts are "wider" than others — that animal, for example, is wider than mammal, and mammal wider than deer — is something so trivial that hardly anyone has bothered making a fuss about it before Rand. But the way some Objectivists talk about the hierarchy of knowledge, you would think that only Rand noticed it, while everyone else is in denial that concepts have any such structure. "Knowledge is hierarchal," Rand's disciples keep insisting; to which the obvious retort is, "So what!" 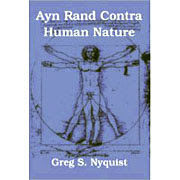 The problem with Rand's hierarchy of knowledge is not that it is wrong but that Objectivists exaggerate its importance. In which John Aglialoro, the producer of the double-bomb "Atlas Shrugged" series and David Kelley, founder of the Atlas Society and official script consultant to the project, place the blame for these spectacular failures on everyone but themselves. Like Plato, Aristotle believed that we obtain all knowledge ultimately by an intuitive grasp of the essences of things. 'We can know a thing only by knowing its essence', Aristotle writes, and 'to know a thing is to know its essence'. A 'basic premiss' is, according to him, nothing but a statement describing the essence of a thing. But such a statement is just what he calls a definition. Thus all 'basic premisses of proofs' are definitions. ...Aristotle considers the term to be defined as a name of the essence of a thing, and the defining formula as the description of that essence. And he insists that the defining formula must give an exhaustive description of the essence or the essential properties of the thing in question; thus a statement like 'A puppy has four legs', although true, is not a satisfactory definition, since it does not exhaust what may be called the essence of puppiness, but holds true of a horse also; and similarly the statement 'A puppy is brown', although it may be true of some, is not true of all puppies; and it describes what is not an essential but merely an accidental property of the defined term. Summing up this brief analysis, we can give, I believe, a fair description of the Aristotelian ideal of perfect and complete knowledge if we say that he saw the ultimate aim of all inquiry in the compilation of an encyclopaedia containing the intuitive definitions of all essences, that is to say, their names together with their defining formulae; and that he considered the progress of knowledge as consisting in the gradual accumulation of such an encyclopaedia, in expanding it as well as in filling up the gaps in it and, of course, in the syllogistic derivation from it of 'the whole body of facts' which constitute demonstrative knowledge.